National Drive Electric Week is an annual celebration of electric cars, organized by the Electric Auto Association, Sierra Club and Plug-in America non-profit organizations. Nissan was an international corporate sponsor that provided giveaway promotions during the event. These included water bottles, micro-USB connector fans for cell phones, carry bags, and pens with the Nissan logo. Nevada events were staged in Las Vegas and Reno during National Drive Electric Week again this year. 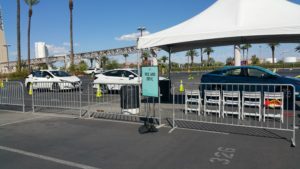 NDEW-Las Vegas was staged at the Springs Preserve museum parking lot under a photovoltaic solar panel array that tracked the sun while providing electric power to four ChargePoint stations. 45 vehicles attended the electric car rally. 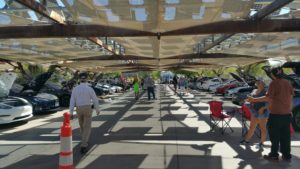 The gathering of electric cars and exhibit booth displays were staged underneath a photovoltaic solar canopy that tracked the sun and also generated electrons to provide electricity to four ChargePoint stations where plug-in electric cars could recharge their battery packs at no cost. About 45 vehicles and 200 visitors participated in the rally that was staged from 10 AM to 2 PM. An original Tesla Roadster electric car owned by David Morse. 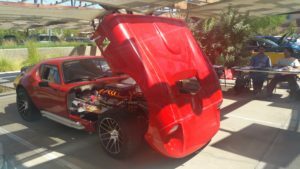 Members of the Las Vegas Tesla Owners and Enthusiasts Group showcased 22 Tesla vehicles, that included an original Roadster, as well as newer models of the S, X and 3 battery-powered electric cars. 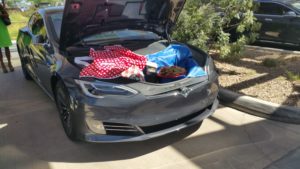 Pop-up catering display in the front trunk (“frunk”) storage space of a Tesla Model S.
Instead of a tailgate party, several owners offered food and drink to visitors from the front trunk (“frunk”) of their Tesla vehicles. Two black Model X vehicles exhibited a tandem demonstration of their falcon wing doors and LED headlights in synchronization to music from the Trans-Siberian Orchestra. 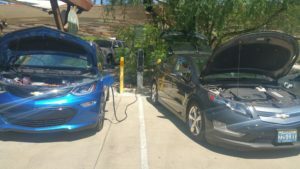 Chevrolet Bolt EV and Volt plug into the solar-powered “juice bar” provided by two ChargePoint stations. 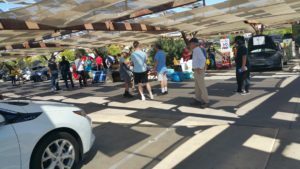 Other plug-in electric vehicles displayed by the southern Nevada EV community included Chevrolet Bolt EV, Spark EV and Volt; a new 2018 Nissan LEAF from United Nissan; older Nissan LEAF models; Ford Fusion Energi and C-Max Energy plug-in hybrids; Ford Focus EV battery-powered electric car; Fiat 500e; BMW i3 and i3 REx models; Mitsubishi i-MiEV; Zero electric motorcycle; and a custom kit car electric conversion replica of a 1965 Shelby Cobra Daytona Coupe. A kit car replica of a 1965 Shelby Cobra Daytona Coupe was converted to an electric car by using Nissan LEAF batteries and other electric car components. 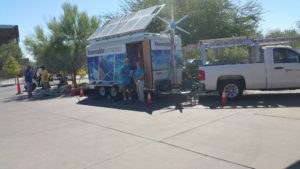 Informational displays at the event included the NV Energy Renewable Generations walk-through exhibit trailer that featured information on rooftop solar incentives for homeowners, as well as solar thermal and battery-backup power system incentive programs available through the utility. NV Energy Renewable Generations walk-through exhibit trailer demonstrated rooftop solar and wind generation hookups, as well as solar thermal heating systems. NV Energy also introduced new financial incentives for the installation of electric vehicle supply equipment (EVSE) throughout the state of Nevada with new programs for workplace charging, multi-family dwelling units, fleet vehicle electrification, and the Nevada Electric Highway. These financial incentives range from $3000 for an AC Level 2 charging station to $15,000 for a DC Fast Charge station. Exhibit booths from local vendors and non-profit organizations provided educational outreach to NDEW visitors at Springs Preserve. Other exhibitors during the electric car rally included the FIRST Nevada FRC high school robotics team from Clark High School, Net Zero Energy Brokers, Green Alliance of Nevada’s Drive Clean Energy program, the Las Vegas Electric Vehicle Association, Nevada Conservation League, Sierra Club, Citizens Climate Lobby, and the Formula SAE Electric Race Car engineering team from University of Nevada – Las Vegas. 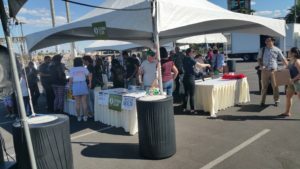 More exhibit booths at NDEW-Las Vegas, including Sierra Club, Citizens Climate Lobby, and UNLV Formula SAE electric race car team. Reno Councilwoman Naomi Durr and Sparks City Councilman Donald Abbot were present at the event. Councilwoman Durr made opening remarks. 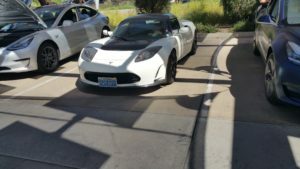 37 plug-in electric cars were exhibited at the event including 21 Tesla models that included an original Roadster, as well as S, X and 3. Other plug-in electric vehicles registered at the EV gathering included Chevrolet Bolt EV and Volt, Nissan LEAFs that included a 2018 model, 2018 Honda Clarity Plug-in Hybrid EV, Toyota RAV4 EV, Mitsubishi i-MiEV, Ford Focus Electric, BMW Mini-E, Volkswagen e-Golf, and a Zero electric motorcycle. SNFA President Marie Steele introduced presentations from three speakers, that included Dan Langford, Innovation Director at the Nevada Center for Advanced Mobility; Joey Marlow, Executive Vice-president of GeoTab, and Francis Julien, General Manager of the Las Vegas Operations for Keolis North America. Smart cities projects can include wireless “road side units” that can send and receive information from connected cars along major city streets to warn drivers about upcoming traffic situations, while also aggregating big data from multiple cars to help analyze and optimize potential bottlenecks during each seasonal and daily commute period. The speakers highlighted partnerships between the City of Las Vegas and Keolis, the Regional Transportation Commission of Southern Nevada, the Nevada Center for Advanced Mobility, GeoTab, Aptiv, Lyft, NAVYA, Audi, and BMW companies to test advanced autonomous vehicle technologies in actual traffic conditions on Las Vegas city streets. Recent Nevada statute revisions during the 2016 legislative session now provide the legal framework to allow fully-autonomous, level 5 operation of self-driving vehicles on Nevada roads and streets. However, most testing of autonomous vehicles around the Las Vegas Strip and downtown traffic areas usually test up to autonomous level 4, that still involves an onboard person to supervise the operations of the autonomous car or truck, and intervene if necessary. The NAVYA autonomous bus shuttle in downtown Las Vegas can carry eight passengers in a loop circuit route near the Container Park on East Fremont Street, but still has an onboard attendant who can hit a full-stop panic button to shut down and halt the vehicle in case of a potential collision. The attendant can also pilot the NAVYA shuttle bus manually by retrieving a hidden joystick and activating onboard computer control menus, if needed. The Lyft autonomous test cars built by BMW and Aptiv still have a driver behind the steering wheel of each ride-share vehicle, to intervene during any unexpected traffic incidents. The Southern Nevada Fleet Association meeting gave a detailed glimpse of possible models for autonomous transportation systems of the 21st century. These autonomous “fleet-as-a-service” systems will be based on electric-vehicle platforms, because of the minimal latency required to digitally control electric motors, compared to the slower response of traditional internal combustion engines. 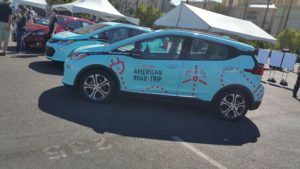 Two Chevrolet Bolt EVs drove from San Francisco to New York City during The New American Road Trip event that stopped in Las Vegas at the Luxor Hotel and Casino. An electric car caravan led by two Chevrolet Bolt EVs and a support crew left San Francisco on September 14th after a US Climate Summit. The team was traveling on to New York for a One Planet Summit at the United Nations, scheduled for September 26th. 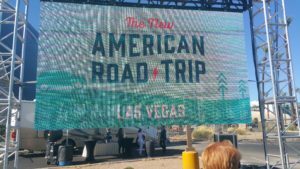 The New American Road Trip attracted spectators during an event in Las Vegas at the Luxor Hotel and Casino. 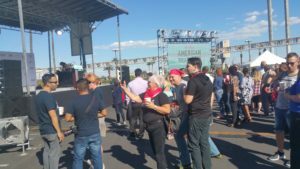 During the Las Vegas stopover, the New American Road Trip organizers staged a celebration event at the Luxor Hotel and Casino that included plug-in electric car “ride ‘n drive” demonstrations, food, music, and entertainment from 3 PM to 6 PM. The Chevrolet Bolt EVs were recharged from an NRG EVgo DC Fast Charger located on Russell Road at a Terrible Herbst station. The drivers looked for both NRG EVgo and ChargePoint DC Fast Charge stations during their cross-country trip. Featured plug-in electric cars for the “Ride ‘n Drive” demonstration included a 2018 Nissan LEAF from United Nissan, a 2018 Honda Clarity plug-in hybrid electric vehicle from Findlay Honda Henderson, and a 2018 Toyota Prius Prime plug-in hybrid electric vehicle from AutoNation Toyota. 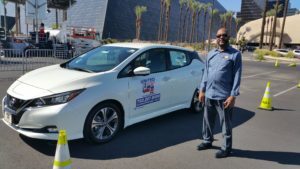 Drivers and riders could compare the performance of the three different vehicles by running the plug-in electric cars through twists and turns within a test track made of yellow cones arranged within a parking lot near the Luxor Hotel and Casino. Noted speakers included Michael Bloomberg, former mayor of New York City and a Special UN Envoy for Climate Change, as well as Jim Murren, CEO of MGM Resorts International, who arrived at the event with Bloomberg in a Tesla Model S electric car. Antonique Smith, an actress and grammy-nominated singer introduced both speakers. 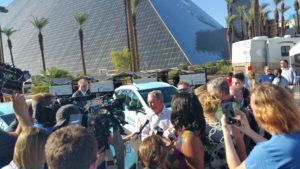 Michael Bloomberg, former Mayor of New York City and Special UN Envoy for Climate Change, addresses media during The New American Road Trip stop in Las Vegas. Local non-profit organizations provided educational outreach information during The New American Road Trip event. 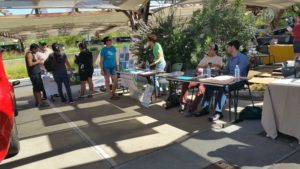 Local exhibitors at the event included the Sierra Club Toiyabe chapter, Nevada Conservation League, Citizens Climate Lobby, and Chispa Nevada. Chispa Nevada was also the recipient of a $7,000 grant from sponsors of The New American Road Trip, who provided seed donations to local non-profit organizations involved in climate change initiatives during each stop of the electric car caravan. More stopovers and events along the roadtrip were planned for Boulder, Colorado; St. Louis, Missouri; Pittsburgh, Pennsylvania; and New York City.